What is keeping HTPCs from the mainstream? The Key Obstacles to the HTPC/Media Center going Mainstream? I think we can all agree that HTPCs, Media Center, SageTV, BeyondTV, XBMC and the rest of these powerful Home Theater PC products are in a very tiny, niche market. One that is made up of mostly technically adept and/or very determined enthusiasts who want more than a DVR, more than a TiVo – just more flexibility and power where you are in control of your media. Note that many (most) of these obstacles were gathered via an interesting Twitter conversation I had with other enthusiasts as well as those who follow (and are aware of) HTPCs to some degree. The number one obstacle in my opinion is complexity. This is a tough one that can only be solved by dumbing down the HTPC or at least making it more appliance like. You can go part-way towards appliance without giving up too much of the flexibility a HTPC gives you but it’s a fine line. Setup & Maintenance Can Be Time Consuming and Requires at Least Some Technical Knowledge. Many of the things HTPC enthusiasts deal with are things we take for granted, but more mainstream consumers wouldn’t have the slightest idea how to do or even want to expend energy doing. It’s Not Plug & Play - To be mainstream it has to be a simple Set Top Box that you plug in and begin exploring. Tuner Cards Inside Computers = Complications/Confusion – If we have to use an internal tuner card its going to be too complicated for the average Joe UNLESS it’s pre-installed. If the tuner is USB that helps things but then you have the “is it compatible with given HTPC software”, is it HD?, will it work with my cable/satellite company? how do I change the channel. The list can go on and on. There are certainly answers for this, but they aren’t easy enough for the mainstream. And most computers we buy do NOT come with a tuner card installed. Too Many Hardware/Software Variables – As it stands today, building your own HTPC requires some serious homework – even for the seasoned HTPC enthusiast you better know what hardware and software combinations will work together the best. And those multitudes of combinations in use makes the support the HTPC software company provides that much harder. Home Network - Lack of home network capability. How many have network connections to their TVs? OR a wireless network that can handle HD? Remote Control – Getting the remote control to work everything. It’s easy for me, but not for the mainstream folk. Self Imposed Complexity – This is sort of a knock on Microsoft or you can look at it as a knock on the organizations that forced MS to put these artificial restrictions on Media Center to get the content they wanted. Microsoft has self imposed complexity with their many format restrictions, lack of viable extenders (XBox360 being an exception), native DVD and/or Blu-ray playback and other weird limitations. Getting content into your HTPC and distributing it throughout your network is a growing concern of HTPC enthusiasts these days. The simple CATV connection just doesn’t cut it anymore – especially with the Cable Companies getting the go-ahead to ignore the FCC rules, limitations of clear QAM and no satellite tuners in sight. The Hauppauge HD-PVR works great for the geeks like me, but won't work for mainstream. Getting Premium HD channels and even regular, non-OTA HD channels isn’t cut and dry for Cable and Satellite customers with HTPCs. And I don’t see this getting any easier. Currently CableCard (for cable) on Microsoft MediaCenter and the Hauppauge HD-PVR are the only two solid solutions for getting that content to the HTPC. And both have their disadvantages and complications. Blu-ray & DVD for Movies – Want to play a movie stored on your HTPC server and stream it to an extender or other computer? It isn’t as easy as it should be and ripping it to your hard drive has it’s legal issues regardless of how you look at it. I can view all ripped and even streamed DVDs and Blu-Rays from my hard drive or my server’s optical drives, but you can’t do this with all HTPCs. Compelling default online channels - Hulu, Netflix etc – Another one that isn’t cut and dry is online delivery of content. Hulu doesn’t want anyone to view their content unless it’s on a computer screen. Netflix is on the XBox 360 and even Media Center, but not on extenders. As the media companies inch closer to online distribution of content this will become more of an issue. While the high price is definitely an obstacle, I personally don't think price is the main issue - if it was then you'd see 50% or more of wealthy households with a HTPC or some sort of media center and that just isn't the case. It is an issue - one of perceived return on investment by the buyer, but I think a smaller one then the others really. If we’re talking about HTPCs going mainstream then the price does come into play yes, but I think price is a smaller issue compared to those above. Names of HTPCs, Extenders, Etc – Is the name HTPC something so foreign and/or geeky that it won’t sell? I think it probably is and thats why I like what Microsoft did with “Media Center.” It sort of gives the meaning that HTPCs are more than just a computer. You Want to Put What in My Living Room? Clutter & complexity of all that HTPC stuff - Server, Tuners, Networks, More computers or extenders or XBox360's around the house. HD-PVR's and/or cable boxes etc. Cords galore! Now that we Have some of the Obstacles Listed, Do we really want it to become mainstream? I think eventually there will be some sort of device or concept similar to HTPCs that IS mainstream. It will be easier to use, but won't be as "powerful." I want something in-between what we have today and mainstream. It has to be popular enough to garner a force with getting content (online and via tuners) and to make it a profitable business for a larger company like MS, Apple and even the CE manufacturers, but it doesn't have to be as mainstream as the DVD Player for instance! You give up way too much to make it truly mainstream. 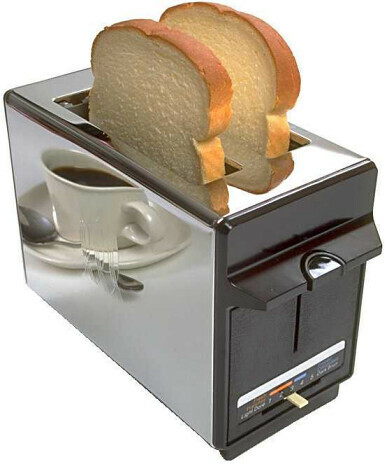 Andy Van Till had a good Twitter quote when I posed the question about mainstream: "Toasters are 'mainstream', I wonder if that is the right target?" I think most of us would agree that toasters aren't what we're going for here. But I think the existing market is EXTREMELY difficult for a company like MS or even Apple to operate in. There just isn't a bunch of revenues there with such a small niche of a market. That's why I think SageTV is pretty successful. They keep it small because they have to, but that gives them the ability to focus on one single market - the enthusiasts. And a decent profit to them is a microscopic drop in the bucket to Microsoft. You see what I mean here? There is a real incentive for a small company like SageTV to push forward through the difficult HTPC market with new features and CE devices even if the numbers of users are small compared to a MS or Apple. Snapstream is another company that was in the market and even with their small size, they've moved on to focus more (or at least split their focus with the enterprise market. Apple had dabbled with the Apple TV but it's hardly a true HTPC. And even if they do come out with a home media device in the next months or years I see it being a crippled device in comparison to a full-blown HTPC. Microsoft will continue with Media Center, but I think they’ll continue down the path of complete focus on the custom integrators as that’s where the customers and the money is. And its a small enough group of customers to be able to support that group and their needs. The enthusiast continues to be left to work harder to get the HTPC/Media Center he or she wants. Some will get that with Microsoft Media Center, some with SageTV, and others will go with the many other options available. But the mainstream customer will continue on with the crappy DVR and eventually VOD boxes that lock them into the content their way and not the customers way of doing things. Entertainment 2.0 Episode 43: Why Aren’t HTPCs Mainstream?